ONEKAMA — The West Michigan D League will likely be a battle to the end of the season. So, win early, stay in the hunt. That’s why when Onekama hosted Manistee Catholic Central on Monday for both teams’ league opener, neither squad gave an inch. 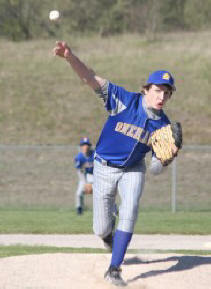 After the Sabers won an 8-4 opener, Onekama rebounded with 3-2 victory in the nightcap. Despite Onekama’s 1-0 lead after the first frame of the series, MCC put together a three-run second and a five-run third for a lead they wouldn’t relinquish. Paced by a strong performance by Nathan Papes on the mound, the Sabers spread just six hits around the lineup which helped score eight runs. Papes threw 11 strikeouts while allowing five hits and four walks. Onekama plated three runs in the bottom half of the third, but were unable score the rest of the way. Stephen Verrett threw the first four innings, allowing eight runs (two earned) on two hits and eight walks with four strikeouts while Dallas Hearit threw the last two frames, allowing just a hit and no runs. At the plate, Joe Eno batted 2-for-3 including a double. Neither team allowed the other’s bats to get into a rhythm in the nightcap, as a two-run fourth and a score in the top of the sixth proved to be all Onekama needed for the win. Verrett led the Portagers at the plate with a double, a triple, an RBI and two runs scored. Eno threw a solid six innings on the mound, allowing just two runs (one earned) on five hits with four strikeouts. MCC scored a run in the third inning, and began a two-out rally in the sixth when Andrew Perry knocked an RBI single to cut the gap to just a run. But, a deep fly ball to left off the bat of Papes ended the game in Onekama’s favor. MCC’s Alex Bialik led the way at the plate with two hits while also pitching the full game, allowing five hits and two walks with three strikeouts. “We didn’t play as well, but we were in it,” said Ranville. “It was a clean game. We didn’t make any errors and I think both teams played pretty good. Tri-School Musical "Thoroughly Modern Millie"